Star Leonard knows exactly what her Blue is. It's a familiar question that the Kansas, Ill., native, who earned a bachelor's degree in biology with a pre-medicine track, posed to her fellow graduates one more time when she took to the podium as the student speaker at the Dec. 15 winter commencement ceremony. "As students at State, we are always asked, ‘What does Blue mean to you?' My response is always multifaceted. Blue means many things to us. Blue means friendship, opportunity and identity," Leonard said. "First, Blue means friendship. Through you, Indiana State, we have gained incredible friendships. Some which were found on the first day of move in and others emerged while crying over a textbook at 2 a.m. Either way, you helped bring these friendships together, and these friendships will truly last a lifetime. "Second, Blue means opportunity. We have learned more than we could have ever imagined as incoming freshmen, including significant life lessons. We have stepped out of our comfort zones and have gained experiences that we never would have otherwise. We joined clubs we never knew existed, and we completed tasks we never could have imagined. Third, Blue means identity. We learned about ourselves, how to be ourselves, and how to interact with others. We learned a lot about diversity and have held inviting and humbling interactions." 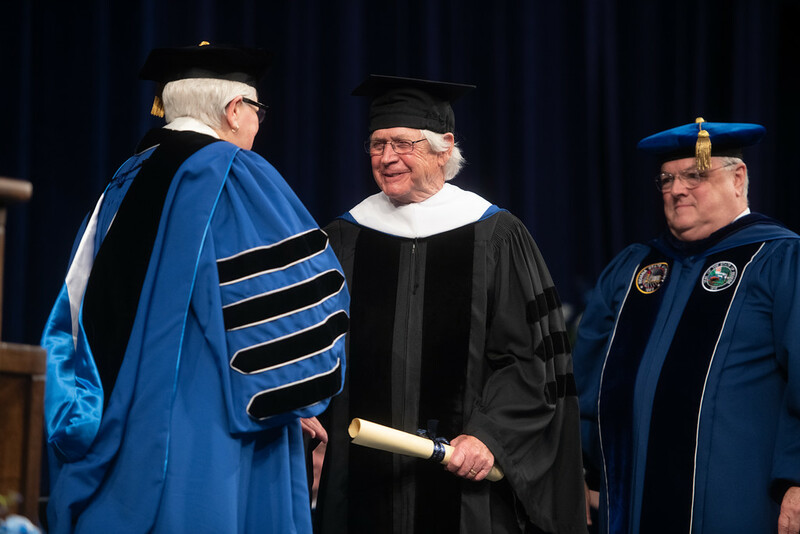 Although the definition varies for each of the 867 students who applied to graduate, including 412 undergraduates and 172 graduate students who signed up to participate in the commencement ceremony at Hulman Center, Leonard said they can all agree "there is always more to Blue." "Indiana State University, you have challenged us to surpass our expectations, perhaps one of our biggest, recurring challenges was when every professor required an exam in the same week," Leonard said. "But overcoming this challenge has pushed us to achieve greatness. Some of us were able to travel the world with you, and some of us do not want to leave. Indiana State, you have brought so many people together and have given us many memories that truly define our commitment to ISU." Leonard encouraged the graduates to live by the values of leadership, scholarship and service that have been engrained in them as Sycamores. "I hope we take these values, and memories and continue to live out our lives as we represent you and ourselves," she said. "May we always be grateful for your guidance and support and may look back and always remember what Blue means to all of us. May we cherish the memories of friendship, opportunity and identity and may we execute leadership, scholarship and service." Those qualities are exhibited by Indiana State alumnus and retiring state Rep. Clyde Kersey, '71, GR '74, who served as alumni speaker and received an honorary doctor of humane letters. "For the last 22 years, I have worked with my good friend, Greg Goode, from ISU to get funding through the Indiana State legislature for ISU's capital projects," Kersey said. "Much has been said about what Greg and I accomplished, but the truth is I could never repay ISU enough for what ISU has done for me. "The two degrees I received from ISU, Bachelor of Science and Master of Science degrees, paved the way for me to have two successful careers. One in teaching, one in politics as a state representative in the Indiana state Legislature, neither of which would have been possible without the incredible education I received from this university." 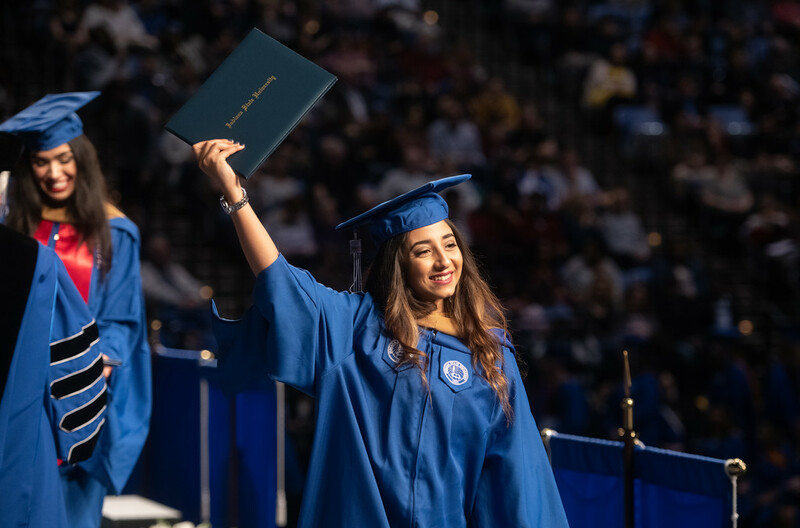 After four years on campus, Kersey said the question now is what is the value of a degree from Indiana State University? The answer lies in what the graduates will do with it. "In a world where we face ecological challenges such as climate change...we need ISU graduates to help our planet become environmentally livable. In a world where we face tensions between nations, leading to trade wars, human rights violations and the proliferation of weapons, we need ISU graduates to promote peace, strengthen cultural and economic relations between people and nations. In a world where we face technological change that breed tremendous advances but at tremendous costs and leading to economic vulnerabilities, we need ISU graduates to help bridge those who are in need with jobs for the future and there by uplifting all Americans. In a world where our nation's institutions of democracy are in danger, we need ISU graduates to lead and live by example through civility and reaffirm public service as a noble calling." Commencement is not an end, but a brand new chapter, Kersey assured the graduates. "The minute you accept your diploma and walk off campus you're a different person, and we are counting on you to be the one our great country can call upon to help lift it to a new and exciting level of greatness," Kersey said. "My fellow Sycamores, thank you for all you have given me. Our work continues so that in 10 years, 20 years, 50 years, 100 years from now forthcoming generations of citizens will carry on the great legacy that is Indiana State University. March on, Sycamores. March on." 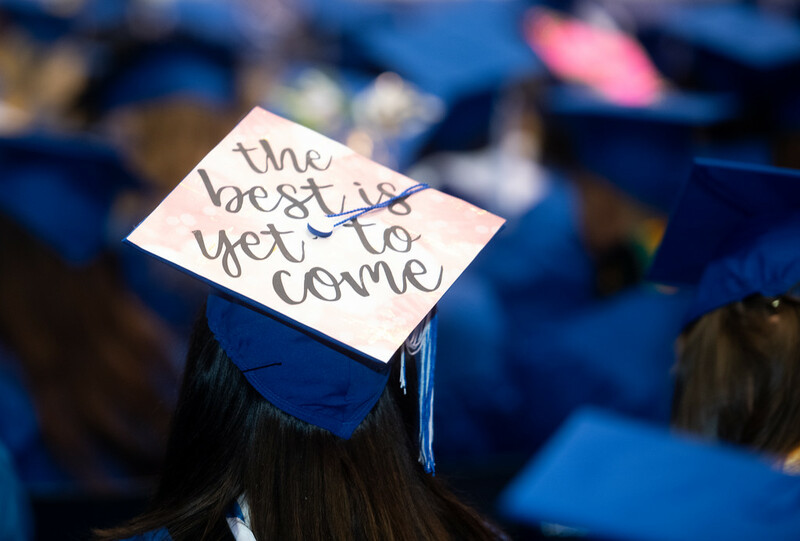 There were 867 students who applied to graduate, including 412 undergraduates and 172 graduate students who signed up to participate in the commencement ceremony at Hulman Center on Dec. 15.